For the most discerning runner, nothing compares to the T631 treadmill by SportsArt Fitness. From the ground up, the T631 is built from commercial-grade components. A powerful 4.0 hp ECO-POWR motor uses 32% less energy and allows for extremely precise speed adjustments from .1 -12 mph in 1/10 mph increments. Incline ranges from 0-15%. The expansive 22x61 running surface accommodates a full stride with room to spare. Features include: contact and telemetry heart rate monitoring, multiple workout programs, fitness tests (Bruce, Gherkin and WFI Firefighter protocols), heart rate control programs, ActivZone icon, ZoneTrainer custom heart rate control, MyFlex deck cushioning system and a user-friendly dot matrix display. 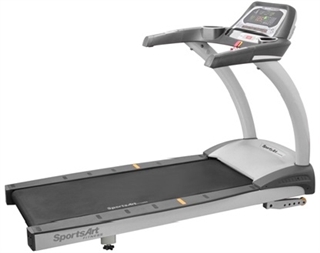 This premium workhorse will not let you down.Telemetry and contact heart rate monitoring Touch-n-go programming makes set-up easy MyFlex deck decreases impact on joints for a safe and comfortable run 22 x 61-inch running surface accommodates longer stride lengths. Running Surface - The extra-large 22" x 61" belt provides ample running space and is constructed from carbon-weave, low-friction material that is resistant to static build-up. Cushioning System - The MyFlex cushioning system reduces heel strike impact and is so durable it has a lifetime warranty. Active Zone - The Active Zone icon illustrates which muscle groups are being activated throughout the workout. 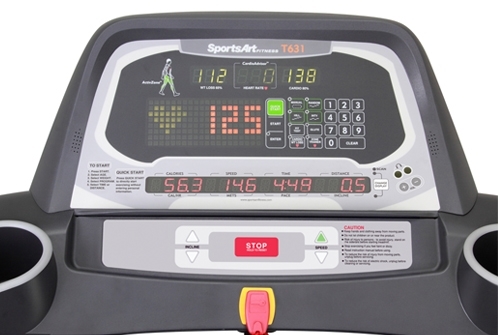 CardioAdvisor - Displays current and goal heart rates for cardio or weight loss training. Console - The state-of-the-art dot-matrix display has fourteen workout programs, including heart rate programming, to keep workouts fresh. FlowTec - The FlowTec motor cooling and cleaning feature allows the 4.0 hp AC servo motor to last - allowing SportsArt to give the motor a lifetime warranty. HP: 4.0 hp AC Servo Motor with FlowTec Motor Cooling & Cleaning. Speed: 0.1 - 12 mph. Display: Dot-matrix with LEDs. Active Zone & Cardio Advisor. Readouts: Calories, Distance, Speed, Incline, Time, Calories per Hour, METs, Pace, Heart Rate & Target Heart Rate. Programs: 14 Programs Total; 3 Interval Programs, Random, 2 Glute Programs, 3 Hill Programs, Manual, Quick Start, Manual/Track, Fitness Tests. Heart Rate Programs: Custom Heart Rate, Weight Loss Heart Rate, & Zone Trainer Custom Heart Rate. Fan/Speakers: Optional 3 Speed Fan. Optional IPod Connectivity. Accessories Included: Oversized Water Bottle Holders. Wireless Chest Strap. Suspension: MyFlex Deck Cushioning System. Power: Dedicated Power Supply Required (N. Amer. ): 120 VAC, 60 Hz, 15A; Consumption: 1800W; Plug: UL NEMA 5-15; Fuse: 15A (6x30mm), 100-120V, Fas. Floor Levelers: Rear Floor Levelers. Options: Medical Handrails, Entertainment Bracket, 3 Speed Fan, IPod Connectivity.